The holiday season often brings out the best in all of us. Families escape the cold weather in warm living rooms, surrounded by those they care about most. It is often a time for reflection – we sit, surrounded by loved ones, thinking back over our triumphs and struggles of the past year while looking towards a brighter future. But sometimes, the struggles of the past are more difficult to overcome. A year and a half ago, East Texas experienced the worst hurricane that had ever made landfall there. Hurricane Harvey affected thousands of citizens. Many of those citizens’ homes were so devastated that survivors had to empty bank accounts and take on debt in order to pay for repairs. In other cases, survivors are staying in homes that still have not had mold remediation. Yet as Hurricane Harvey becomes more distant in time, it also becomes more distant in the minds of those who were not affected. For many survivors, compassion and empathy from neighbors has run out, while the holidays have become especially difficult. Parents feel pressure to provide gifts for their children, while the children are looking for any semblance of the normalcy they knew before the storm. This year, Save the Children and Good360 worked to make sure these families were not forgotten during the holidays. 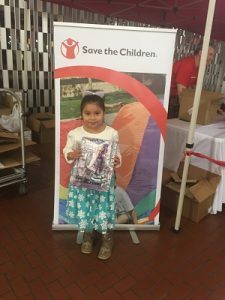 Save the Children worked with organizations that service five counties to ensure that each child affected by Hurricane Harvey would have a gift for the holidays. But the organization knew they couldn’t do it alone. 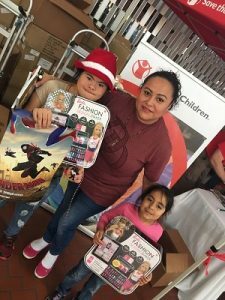 Save the Children reached out to Good360, who drew upon holiday donations from multiple donors to supply Save the Children with donations for over 3,000 families throughout eastern Texas. These toys from Mattel and other donors restored dignity to parents who no longer needed to worry about a giftless holiday season, while renewing a sense of hope for the future for the children recipients. Although Good360 continuously gives throughout the year, we recognize the special importance of supplying families with highly needed goods during the holidays. This is a time for love, reflection and togetherness. Good360 is blessed to be able to play a vital role in that giving.